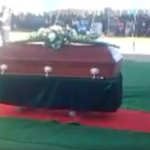 The funeral service of the late was held at the Ongula yaNetanga village on Saturday and besides family and friends attending, former President Hifikepunye Pohamba, Deputy Prime Minister Netumbo Nandi-Ndaitwah, Ondonga Prince Shuumbwa Nangolo, representative of king Immanuel Kauluma Elifas also paid their final respects to the veteran of Namibia’s liberation struggle. The President of Namibia, Dr. Hage Geingob in his capacity as president of the SWAPO Party also sent a message of condolence which was read to those attending the funeral on Saturday. In his message of condolence President Geingob described the late Chief Kauluma as a stalwart of the SWAPO Party who dedicated his life and sacrificed more than some to bring about the liberation of Namibia. On Monday, 11 February 2019 one veteran member of the SWAPO Party Cde Shimweefeleni Peter Kauluma took his last breath. On behalf of the SWAPO Party leadership, and the rank and file, I wish to express our sincere condolences and deep sympathy to his children and the bereaved family. The SWAPO Party lauds the contribution of this foremost stalwart to the conceptualization, development and phenomenal growth of the SWAPO Party into a formidable popular political force. Together with other giants of his generation such as Andimba Toivo Ya Toivo, Peter Mueshihange, Tobias Hainyeko, among others, Cde Kauluma was one of the founding members of Ovamboland People’s Congress, in Cape Town in 1957, later transformed into Ovamboland People’s Organization (OPO) and then into SWAPO in 1960. Cde Shimweefeleni remained in Cape Town while some of his compatriots including Mueshingage and Hainyeko left for exile in the early 1960s, while Ya Toivo was deported to Namibia in 1958. Cde Kauluma was himself subsequently deported to Namibia in 1969. He continued his active underground work for SWAPO, especially among the SWAPO Youth League activists in northern Namibia. When the war of national liberation intensified in the mid-1970s, Cde Kauluma was arrested by the apartheid regime in 1976, and was incarcerated without charges. He was accused of aiding guerrilla fighters of the People’s Liberation Army of Namibian (PLAN) SWAPO military wing. Although he was subjected to degrading and dehumanizing torture at the hands of the enemy, the revolutionary spirit that coursed through his body, allowed him to resist all attempts to break his will. Cde Kauluma was an important asset in SWAPO and PLAN underground network. For 37 long years, Cde Kauluma served Omukwaniilwa Cde Immanuel Kauluma Elifas with unquestioning loyalty and dignity. He possessed a natural acumen for dealing with traditional matters and this was extremely valuable for Omukwaniilwa Cde Elifas and the Ondonga community, particularly during the war of liberation. He continued to provide sound advice to Omukwaniilwa Elifas after independence as Senior Traditional Councillor and Chairperson of the Ondonga Traditional Authority. Cde Shimweefeleni was a person who personified kindness and humility. As we bid him final farewell, we salute this dedicated son of the soil for his loyal service to our people and country. He had come to occupy a special place in the lives of so many Namibians, through strength of character, patriotism, selflessness and integrity. These characteristics, coupled with his valorous deeds have cemented Cde. Kauluma’s legacy as a stalwart of our liberation struggle. To the children, the entire bereaved family of Cde. Kauluma, you have lost a father, brother, a cousin and an uncle. The SWAPO Party and the nation have lost a dedicated son of the soil. At this solemn hour, let our comfort and strength come from the Almighty, who gives and takes according to His will. Although we share in grief, we also share in our determination to ensure that Cde Kauluma is never forgotten and that his legacy will continue for generations to come.